We all know that most female celebrities have incredible sense of style, which translates to everything they put on. From clothes to jewelry, some celebrities just know how to rock it. Here's a short list of celebrities who know how to carry themselves well and who wear some of the most gorgeous engagement rings you'll ever see. Scarlett's recent engagement to French journalist Romain Dauric was sealed with a delicate art deco inspired piece featuring one round brilliant cut diamond in the centre of a rectangular setting with a smaller round brilliant cut diamond above and below. The feature diamonds are surround buy smaller diamonds with two art deco styled columns on both sides and set in white gold or platinum. The engagement ring certainly has an incredibly beautiful, nontraditional style that suits Scarlett's old world Hollywood style. As expected, Kanye West spared no expense creating the perfect engagement ring for the mother of his daughter North, now his future wife. The most talked about ring of the year was chosen at the 11th hour with Kanye creating three different rings and making the final decision only the day before he got down on bended knee at the San Francisco AT&T park in front of family and close friends. The dazzling boulder was designed by Kanye and created by Kim's favorite jeweler Lorraine Schwartz, who is, coincidentally, the same designer who created her engagement ring from Kris Humphries. The ring features a D color, 15-carat flawless cushion cut diamond set on a platinum band worth an estimated $8 million. 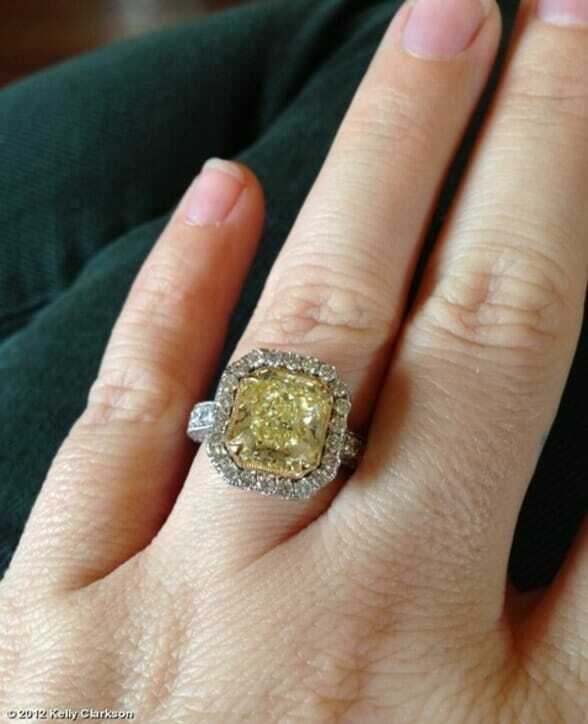 Kelly's amazing ring highlights how beautiful colored diamonds can be. Engaged to Brandon Blacksock last December, he presented the bubbly Kelly with canary yellow diamond ring. The ring designed by Johnathon Arndt features a canary yellow radiant cut diamond that is reportedly over 5 carats surrounded by a halo of smaller white diamonds set on a diamond covered platinum band. The beautiful unusual setting of Olivia's ring suits her quirky personality. Her fiancé, Jason Sudeikis, got down on bended knee and placed a gorgeous antique diamond and emerald ring on Olivia's finger. The round brilliant cut diamond features a halo of green emeralds encased in yellow gold on a plain yellow band. The much-anticipated engagement of long time couple Jessica Biel and Justin Timberlake was celebrated with an incredibly beautiful ring. Justin co-designed the engagement ring with jewelry designer Leor Yerushalmi. The setting features a hearts-and-arrows rounded square cut center diamond surrounded by two halos of diamonds. The band has a U of white diamonds on both sides encasing a gorgeous aquamarine stone, Jessica's birthstone and descending into a band of three channels of white diamonds. The white gold and black rhodium gives the ring a beautiful antique feel. Reese Witherspoon shows perfectly that sometimes a simple setting is the most beautiful. The southern belle said yes to her agent husband Jim Toth and he presented her with a stunning 4-carat ashoka cut diamond set on a platinum band with pave diamonds designed by jeweler William Goldberg. The beautiful yet simple setting allows the beautiful ashoka cut diamond to stand on its own displaying its beauty without fuss.